• How old is your roof? If your roof is on the downside of its lifespan, especially if it is nearing the end, you may find that it will be better to repair rather than to re-roof. • What type of damage has your roof experienced? 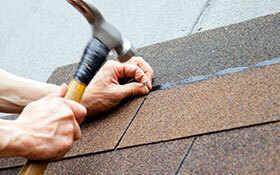 Minor leaking may be easily repairable, and deteriorated shingles may be easily restored. Extensive damage may be beyond repair, however. Reroofing will more than likely be your best route. Depending on the type of damage, this process might be covered by homeowner’s insurance. Contact your insurance agent soon after the damage occurs. • What are your long-range plans? If you are not planning to be in your home for long, the most budget friendly choice may be to repair rather than to re-roof. However, if you are already in your dream “forever” home, a new roof will not only add life to it but also will add to your home’s value. In this case, it is a large financial investment that will result in years of positive return for you. When you are ready to make a decision about your roof, the Big Fish Roofing team will make sure that you are completely satisfied from start to finish. We are committed to providing you with a quality roofing job tailored to meet your needs and your budget.